1. Neatly-made beds/cots: We have some cots in Paranoid, but they are grungy and were intended for use in the prison areas. I'm looking for nicer cots to be used in the barracks for the security guards. We can either re-skin the existing bed (Bed01, DooMEd# 30286), or get a completely new model. 2. Satellite dishes and/or radomes: This is in keeping with the player's mission to disable communications. At this point, these are the only models I can think of. I'll add to this list as I come across a need. Satellite dishes; mostly from Quake 2. They are animated but a bit chunky and low-poly. There might be something more detailed in the Duke Nukem hires pack but I can't check right now. Not animated (but I could probably give it a simple animation of such a thing was needed). Military cots; single and bunk. These might be by Willem Sitters. I really like the DN hi-res version. A simple swivel motion might actually be just what we need. One state can be swivel, one can be stopped. 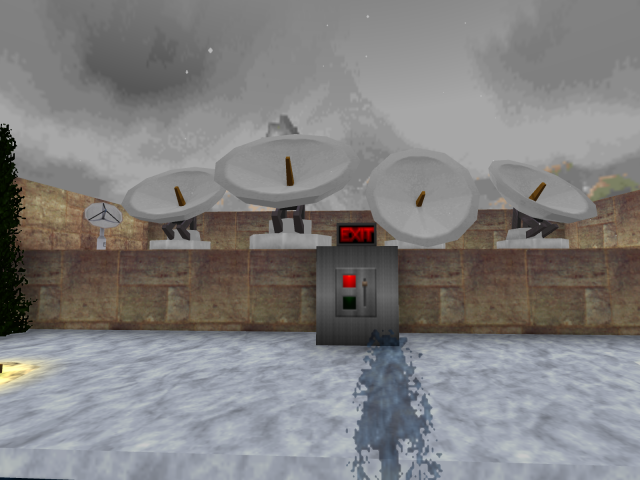 In this way, the player (say) presses a switch to stop the satellite dishes from moving, thereby signalling that the communications array has been disabled. I like both the military cots. In fact, I have already created 2 barracks - one is larger with more beds, intended for the enlisted men (non-officers); the other is larger with fewer beds, and with a dedicated break room (couch, TV, conference table, etc.) for the officers. The bunks will go well for the former; the single will go well for the latter. If you have these models handy, would you please send them to me when you get a chance? Zip to email, or web link via forum/PM/email would work. Thanks. OK, here we go. The beds and the radar dish. I have just included the models "as is" i.e. no modeldef, test map or whatever. If you want that, let me know. I haven't animated the dish (yet) but a simple swivel or tilt would be easy enough so I should be able to fit that in at some point. I noticed that the dish is meant to be huge (or, as I believe it is pronounced these days "yuuuge"). The biggest clue to this is the ladder on the back. So, if the model is scaled to be smaller than full intended size, the ladder would look odd and give the scale away. I can easily remove the ladder if you want so that you can scale it to whatever size you feel suits the map. Thanks for the very quick response, Boss. As for the animation, there is no urgency, as the satellite dishes will be used in the final map. I will do the modeldef and summon the sat. dish to see how big it actually is. I don't really see the size as being an issue, but if it needs to be scaled down you can remove the ladder. I will do the modeldef and summon the sat. dish to see how big it actually is. I don't really see the size as being an issue, but if it needs to be scaled down you can remove the ladder. I did the modeldef & DECORATE definitions, and summoned the actors. Very nice! 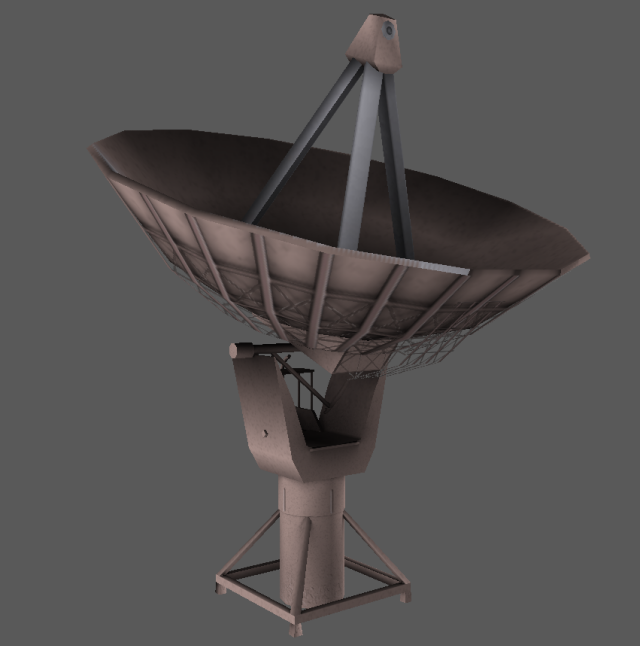 As for the satellite dish, I didn't realize that you meant the model needs to be scaled up. No worries, about the scaling. My current plan is to have the satellite dishes on a rooftop or compound that the player can't reach, but can see. In this way, I can hide the ladder side of the model, so even if it isn't properly scaled it will not be obvious to the player. To be honest, I didn't know if the model would be big or small when imported into the game. Unless I specifically check, it isn't always something that is immediately obvious with models. I more meant that I don't really know what size you want the overall thing to be in game so if the scaling (big or small now I think about it) makes the ladder on the back look an inappropriate size for a human to be climbing it, it's an easy job to take the ladder off. The ladder is the only part that really ties the model into a "it's meant to be this size" kind of situation so removing the ladder frees you up to scale it to whatever size you want.